Sushi Train Labrador Station 4th Anniversary Sale!! Greenslopes Station Grand Opening Sale!! 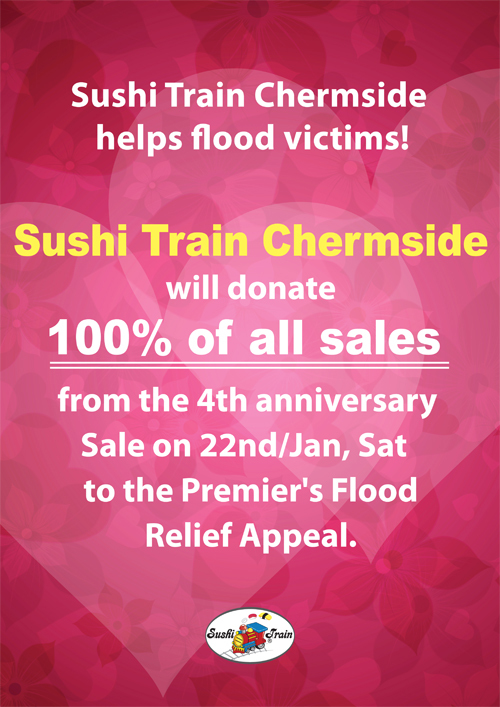 Sushi Train Chermside Helps Flood victims! Welland Plaza Station 1st Anniversary Sale!! *Sorry no booking, Udon or Platters are not available, this offer is only available in Sushi Train at Welland Plaza. *VIP member cards are not accepted on the sale day.We apologise for the inconvenience. Chermside Station 4th Anniversary Sale!! Christine Corner Station Half Year Anniversary Sale! !